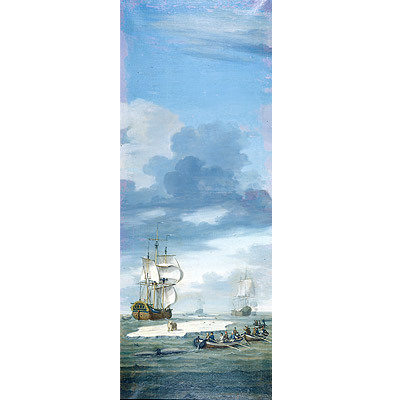 In the 17th and 18th centuries, the Dutch had a major whale fishery. Dutch marine artists painted it. These paintings may have been designed for a house or hall. They are in pairs and could fit around tall narrow windows. The setting presents a complete view of the Greenland whale fishery, one that the artist must have seen. One of the museum’s founders purchased these from the Hearst Collection in California. After his family left Searsport , they were in the whaling business and collected whaling art. One of the museum’s founders purchased these from the Hearst Collection in California. After his family left Searsport, they were in the whaling business and collected whaling art. 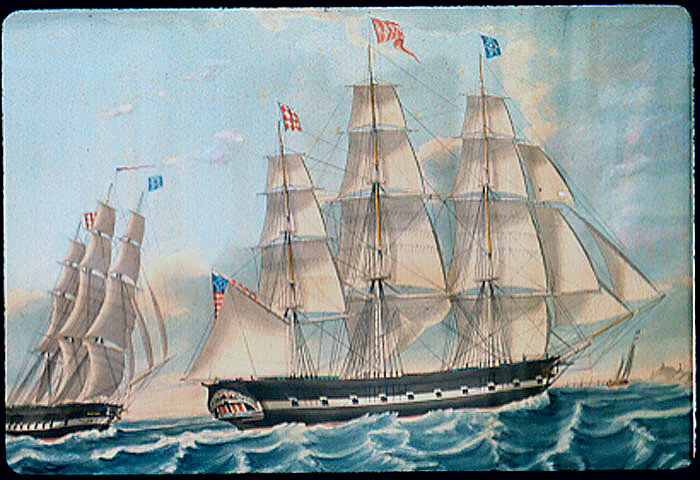 This ship portrait shows the ship B. Aymar, built in Searsport in 1840. 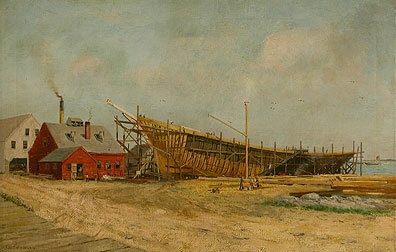 She was the first full-rigged ship built in the John Carver yard. There is both a bow and a stern view of the vessel, something common in early ship portraits. She was commanded by Captain Joshua Slocum in 1873; he sailed her until she was sold in Manila in 1876. 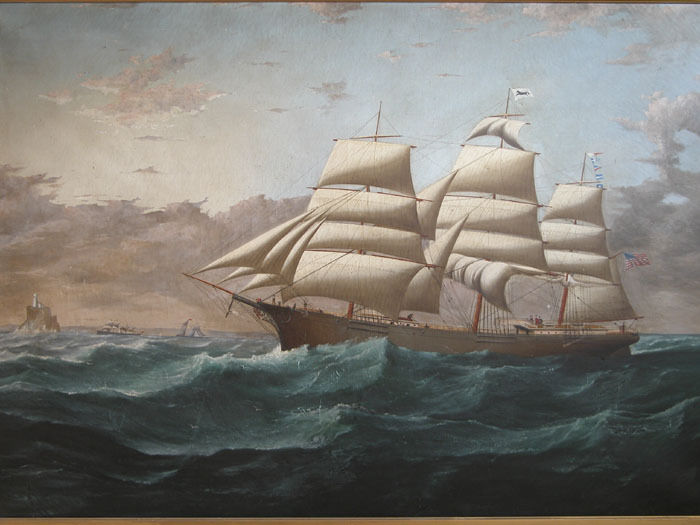 Teupken was an Amsterdam based artist; the Aymar sailed out of New York and must have visited Amsterdam early in her career. Signature has been cut off, but this painting is attributed to Charles Waldron. The Great Admiral was built in Boston by Robert E. Jackson of East Boston in 1869. 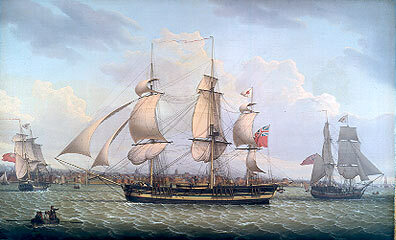 She was the most famous ship of the Weld Fleet, having an active life of 37 years. Named for Admiral Farragut and commanded for 12 years by Captain Benjamin Thompson of Winterport, Maine, the Great Admiral foundered in a storm in the Pacific in 1906. Under the Weld ownership, she was commanded by Captain I.N. Jackson, Captain Benjamin Thompson, Captain William Chatfield, and Captain J.F. Rowell. 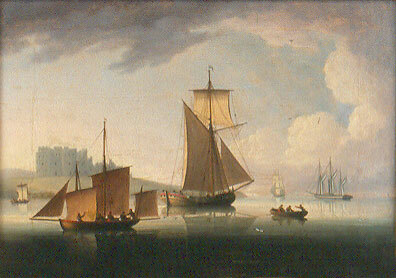 Busy port scenes were a favorite subject for James Buttersworth. Here, he portrays a classic New York harbor view. On shore, to the left, is Castle Garden (immigration headquarters before Ellis Island) and Fort Williams on Governor's Island from which a salute is being fired. 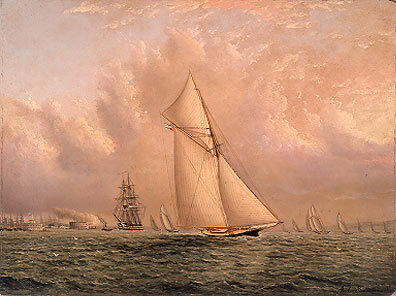 In the midst of a yacht race, a ship of the line is being towed into the harbor. 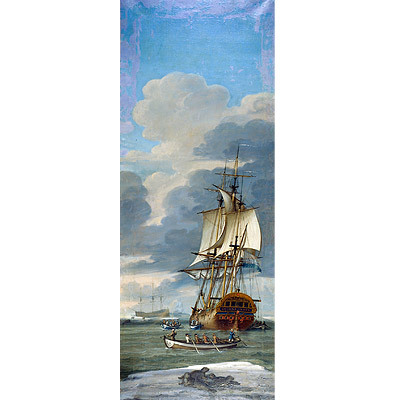 A racing sloop with a prominent owner’s flag, probably belonging to Buttersworth’s paying or potential customer, dominates the foreground. Signed, lower right. 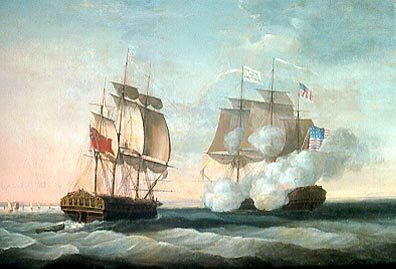 William Parr, who later became partners with Robert Bagott, owned these vessels, including the center ship and the brigs Betsy to the left and Phoenix on the right. The world was a dangerous place in 1809, when French and Spanish privateers and naval vessels roamed, ready to snap up unprepared merchant ships. Indeed, Betsy had been taken from the French. Here, Buttersworth portrays the mix of shipping traffic along the English Channel near the coast in a scene evocative of earlier Dutch paintings. The Dutch sloop, also reminiscent of an earlier era, is juxtaposed with an early steam vessel with auxiliary sails. 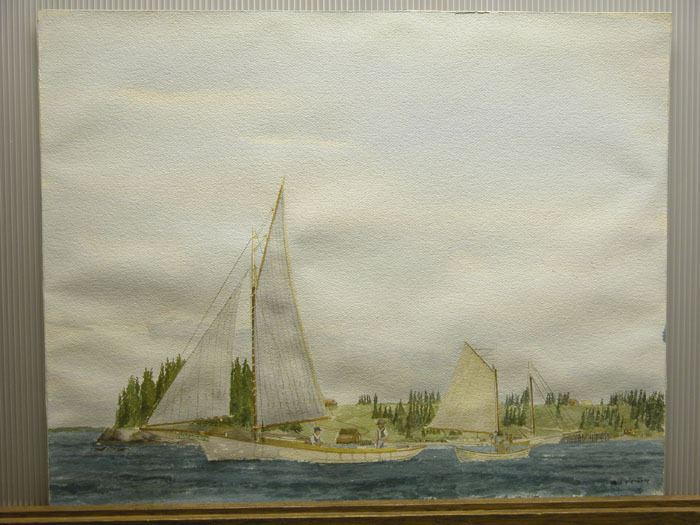 The lug-rigged open boat on the left is in the French or British style, locating the scene perhaps on the Flemish coast or in the Thames estuary. The effect is a stunning picture. At first glance, it could be from the mid-1700s, yet in fact was painted 50-75 years after that.